A Midland property developer set to build nine new homes on a one-acre site it has purchased in Halesowen, thanks to a £600,000 funding deal with Lloyds Bank Commercial Banking. Eden Properties, owned by brothers Darren and Andrew Cutler, is a full-service property development business, offering land buying and planning services through to the construction and tailored design of each property. 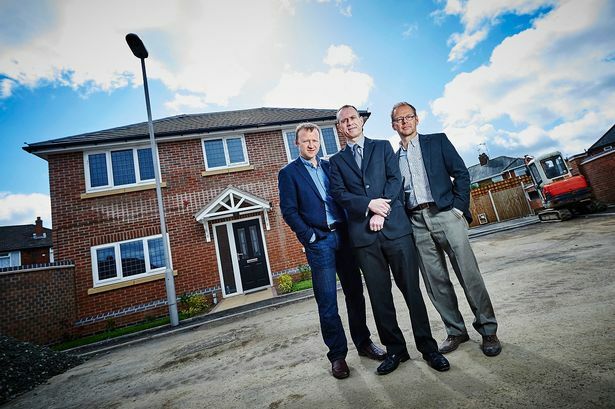 Having built homes throughout the Midlands since 2000, the brothers identified a site on Tenlands Road, Halesowen, and approached Lloyds Bank for a £90,000 loan to support the purchase of the land. Funding was granted using the Funding for Lending Scheme (FLS), which offers lending to small and medium sized businesses across all sectors. An additional £510, 000 loan was provided to help fund the construction and design of nine new detached and semi-detached houses. The properties on the site range from two to four bedrooms in size. Darren Cutler said: “We are always on the lookout for new investment opportunities to build our portfolio, and as we continue to grow we are looking to increase the size of the developments we work on. Matt Ruff, relationship manager at Lloyds Bank Commercial Banking, said: “Eden Properties has experienced steady growth in the 15 years since it was established, building impressive properties throughout the Midlands. “Running more than one site at a time will not only benefit the business, but will also increase opportunities for local sub-contractors, having a positive impact on the region’s economy.